Get wine with free shipping on 12 bottles or more. So, what do you think of Wine Quiz #29, A Guessing Game? I now understand that I goofed up with my logic (not the first time; sigh) and the way second question was asked implied the answer for the first – so I definitely have a room for improvement. I still hope it was fun, and – we have a winner! 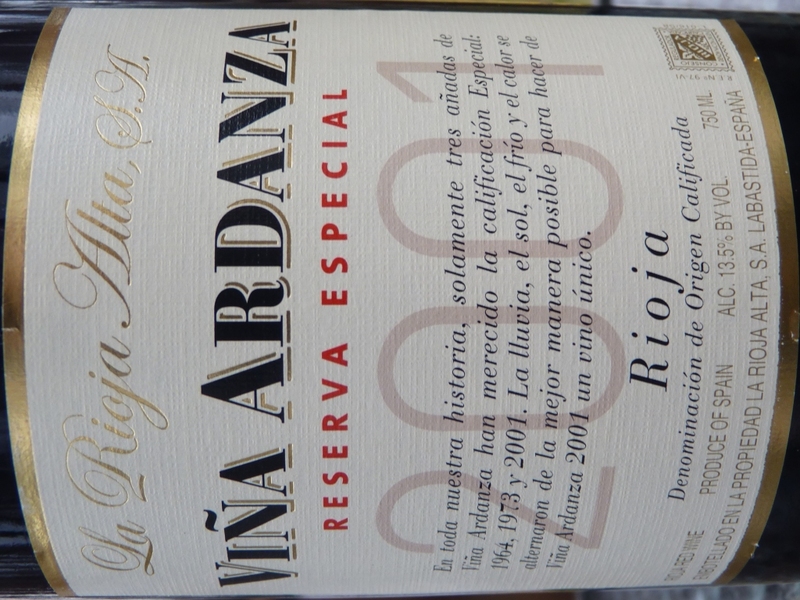 Both reviews included into the post were for the same wine, 2001 La Rioja Alta Vina Ardanza Reserva Especial – the first one was written by Robert Parker, and second was Stephen Tanzer’s review. And the winners are (drumroll, please) whineandcheersforwine and thedrunkencyclist – both were able to correctly answer all three questions including the bonus part. Well done! As a side note, this is one of the best Rioja wines you can find for the money – it will cost you between $25 and $30, it drinks perfectly now, and will be for the next 20-30 years. And now let’s move on to the interesting news section. On October 2nd, the greatest purveyor of the QPR wines, Wine Til Sold Out, says “Make room in your cellars”, and I say “hold on to your wallets” – Full-On Marathon is coming. Starting at 6 AM Eastern time, WTSO will be offering wines staring from $15.99 and going all the way into the hundreds of dollars. The event will end at midnight on the same day. Knowing WTSO, this will be one amazing event which will put your family finances in a grave danger – but if anything, it will be fun to watch! I almost missed it (changing the post after it was out) – International #GrenacheDay is coming on Friday, September 21st! There is not much time left – find that Grenache bottle and get ready to celebrate! Champagne lovers, your special day is coming! 3rd annual #ChampagneDay will be celebrated through all social media outlets on October 25th – you can find your invitation here. You have enough time to be well prepared – start thinking about that special bottle. There is an interesting debate going in regarding the actual state of the wine blogging – best of the best are trying to figure out if it is dead or alive (as I’m writing this post, I would consider it quite alive, but what do I know…). Here are couple of viewpoints: Joe Roberts, a.k.a. 1WineDude, and Steve Heimoff. If you have an opinion – write a blog post, join the debate! Last but not least, St. Emilion region in Bordeaux has a new classification – you can read more about it here in Dr. Vino’s blog post. We are done here – the glass is empty – for the moment, of course. Cheers! The whole wine blogging is dead was started by Jamie Goode (who was a finalist this year for the best overall wine blog at WBC). Joe seems to have really taken this concept and run with it. He also never seems to pass up the opportunity to go toe-to-toe with Heimoff! I thought I would bring it to the attention of my readers, as I think this is an interesting topic to poke. What’s up with all these wine days? That must be an American thing.. Or at least we don’t care a lot about it over here. I don’t get it really. It is hard to tell – some of those are originated internationally – like Riesling was during summer ( originated by German organization), Grenache is often starts celebration from France, Tempranillo (coming in November) has some Rioja counsel behind it. Makes perfect sense – this is exactly what I’m doing : ) I also take it more as a writing challenge than a drinking one – I usually try to produce a post on the subject of particular day, not necessarily to open that exact bottle. Wine blogging dead? No way. Especially not when you look at your posts each week. You are really doing an awesome job. There are lots of Rose (still available) in the stores, but the selection will be probably declining as temperature will be dropping. In general, if you are looking for something more delicate, most of the Provence Rose will be fine. If you need some substance, you should look for Spain and Italy (California and Oregon might be overpriced). I wrote a post about 3 month ago about Rose: https://talk-a-vino.com/2012/05/29/rose/ I would think that some of those are still available at least at Cost Less Wines in Stamford (this is where I tasted them). So all that wine buying may cut into your wine drinking time that week? I am open, just need to set up childcare. Looking fwd to it! Yeah… No worries – I’m at complete zero – zero space in the cellar, $0 available budget – I will follow WTSO strictly vicariously ; ). But I usually have fun collecting and then posting information about actual wines which were offered. Pick a day which works better for you – I’m pretty much open during that week.